Working with the Bicycle Coalition of Greater Philadelphia, the Association for Public Art (aPA) bike tours are back! Enjoy a FREE public art bike ride exploring Pavilion in the Trees and the newly-installed Big Bling, both by artist Martin Puryear. Puryear's large-scale, temporary Big Bling and Fairmount Park hidden gem, Pavilion in the Trees (1993) were both brought to Philadelphia by aPA. The ride will also highlight other sculpture in West Fairmount Park and along Kelly Drive. 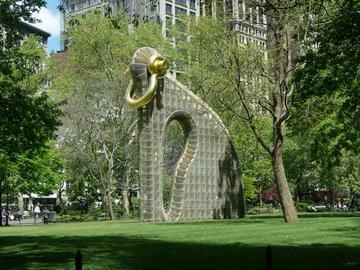 Presented by the Association for Public Art and commissioned by Madison Square Park Conservancy, Big Bling is on view in Philadelphia June-November 2017. This bike tour is an approximately 10.5 mile loop, highlighting sculpture in West Fairmount Park and along Kelly Drive. The tour will begin and end at Iroquois Park at 24th Street and Pennsylvania Avenue, near the Iroquois and Symbiosis sculptures. Please bring a water bottle, a light snack, and helmet. If you do not bring your helmet, you will not be able to participate. These tours are recommended for urban cyclists with some experience riding on busy streets or in traffic. We will be traveling at a leisurely pace. Our bike tours are free, but registration is required and space is limited!